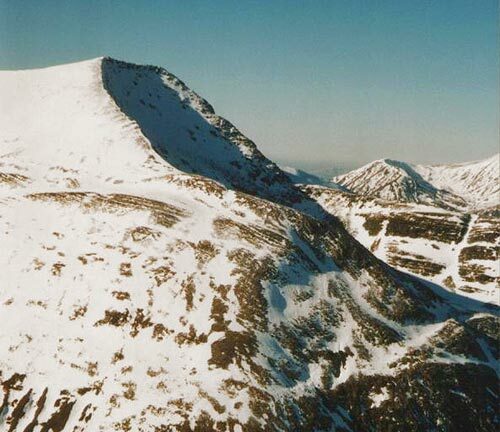 Binnein Mor, which is the highest of the Mamores, has a S ridge which connects it to Na Gruagaichean via a minor top (1062m). 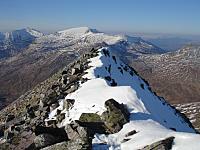 Binnein Mor has three other ridges, N, NE and ENE which enclose two craggy corries. Normal ascent is by a scramble up the NE ridge or on the high ridge from Na Gruagaichean. Slopes are moderate but there are many crags. 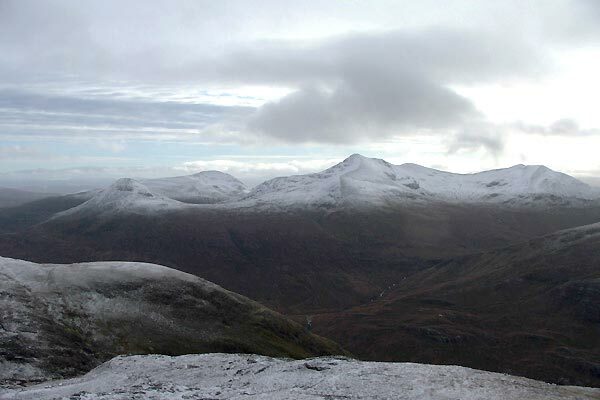 Binneinn Mor in the centre, with views of Binneinn Beag and Na Gruagaichean. 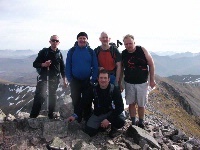 Taken on route to Aonach Beag. The narrow summit ridge of Binnein Mor, March 07. 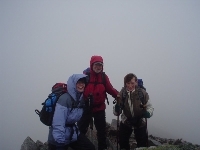 Binnein Mor from Stob Coire a' Chairn; 7th May 2008. 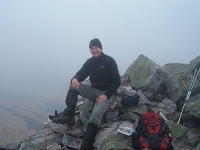 The summary information of one or more ascent routes that include Binnein Mor. 1 1530 m 16.97 km 6 hrs Binnein Mor and Na Gruagaichean A moderate route with some exposure on ridges and summit of Na Gruagaichean. Easy access on paths. 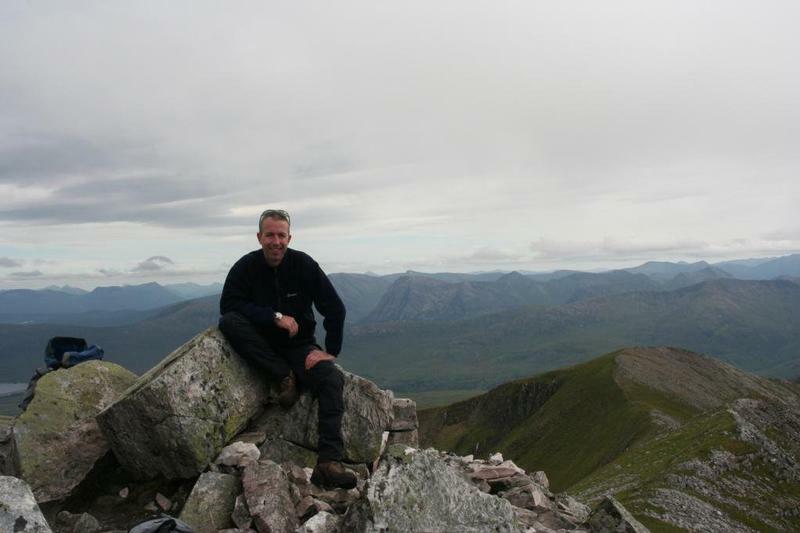 Post a few words about Binnein Mor or read what others have had to say. Approached from the Lochan at Binnein Beag.There is a choice of taking on a long line of crags to the East or to the West where a steep but grassy slope takes you to the crest of the hill and an Easterly walk up, then gradualy a slight scramble of large boulders to the impressive narrow summit.This is an immense view point with Binnein Beag, dwarfed below but looking very impressive from this vantage point.Ben Nevis and all the hills of Lochaber and Glencoe are in fine view.Sgurr Eilde Mor also looks impressive from here.There is a Westerly connecting ridge to the next Munro Na Gruagaichean. Ascended directly onto the north ridge (the middle of the three) from the loch below Binnein Beag - it's not as steep as it looks. After an easy level section, the final steepening of the ridge to the summit of Binnein Mor looked intimidating rising out of the mist, but it turned out to be straightforward, with easy routes skirting the tougher scrambling bits - though a touch exposed in places. Fantastic route to the summit of a superb mountain - i'll try a different approach route next time: Spoilt for choice on Binnein Mor!